A2A is continuing to build on the previous Road Ecology Work on Highway 401. See the 401 report here. Through additional funding from the Ontario Ministry of Natural Resources and Forests, A2A has now assessed road ecology along the Highway 2 corridor - in partnership with Queen's University. 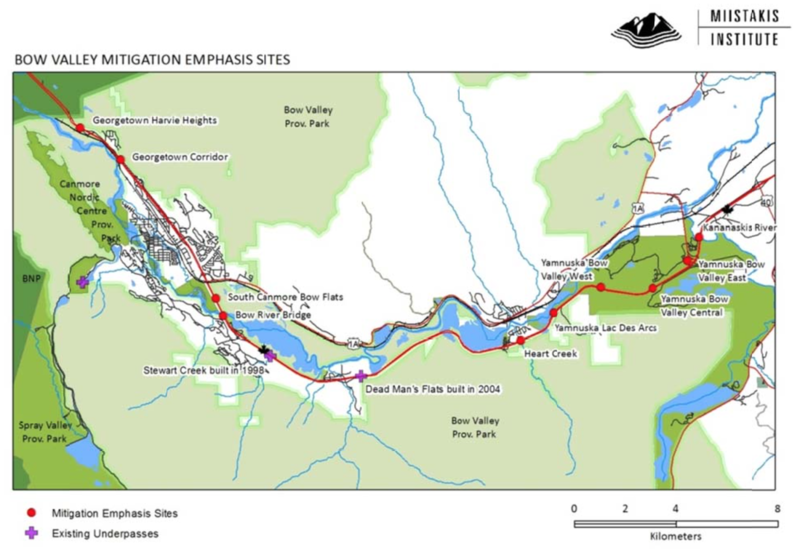 The most recent report on Highway 2 is available here. Miistakis in partnership with the Western Transportation Institute has completed a study that evaluated the best locations to mitigate the effect of the TCH within the Bow Valley on the local wildlife populations and provide for reductions in wildlife-vehicle collisions (WVCs). In addition, the study conducted cost-benefit analyses to show where investments in mitigation may provide a net savings to society. The study was funded by the G8 Legacy Grant administered by Alberta Ecotrust Foundation. The total number of WVCs for the study section between 1998 and 2010 was 806 or an average of 62 WVCs per year. This amounts to an average cost-to-society of $640,922 per year due to motorist crashes with large wildlife, primarily ungulates. Results indicate there are ten sites where mitigation measures would address a combination of values: local and regional conservation needs, high WVC rates, land security (can’t be developed) where mitigation measures are made, and mitigation options that make good sense and were not engineering challenges. Five of the ten mitigation sites had average annual costs exceeding $20,000 per year due to WVCs making each of these an excellent candidate for cost effective mitigation measures. The report provides each mitigation site with its own particular blend of recommendations for how best to mitigate the effect of the TCH on the local wildlife populations. An analysis of a wildlife underpass with fencing at a 3 km section of the TCH within the project area near Dead Man’s Flats showed that total WVCs dropped from an annual average of 11.8 per-construction to an annual average of 2.5 WVCs post-mitigation construction. The wildlife crossings and fencing reduced the annual average cost by over 90%, from an average of $128,337 per year to a resulting $17,564 average per year. These results highlight the cost effectiveness of highway mitigation at Dead Man’s Flats. Download Report: Lee, T., Clevenger, A. and R. Ament. 2012. Highway Wildlife Mitigation Opportunities for the Trans Canada Highway in the Bow Valley. Final Report. G8 Legacy Fund, Alberta Ecotrust Foundation. 72pp.